For myself Lughnasadh is a time to honor Macha. In Ireland Lughnasadh was celebrated with games of skill and horses races. One of the events during Lughnasadh was known as "óenach" which is glossed as "a contention of horses" and would have included swimming and racing horses (O'Donovan, pg. 127-128). It can be speculated that these races may have been a way to showcase the best of the herd and whose stock would be the most sought after for sale during such harvest festivals. When we look to the Morrigan’s mythology there is a pretty significant horse race that occurs at an unnamed assembly. We can only speculate that Macha races the king’s horse during this festival, but given Lughnasadh’s association with horse racing it would make sense. For this ritual the quarter calls are less about the elements so much as telling the story of Macha’s race. If doing this as a group ritual you may wish to read a version of the story to those gathered or create your own retelling (or re-enactment even) of the story for those who may not be familiar with it. It goes something like this. Macha appears one day at the door of a widower, she becomes his wife and as a result his fields become fertile, his house is set in order, and Macha becomes pregnant with twins. When her husband leave to attend a great fair she tells him not to speak or boast about her. He agrees but of course breaks his word and boasts that his wife is faster then the king’s finest horses. The wrong people overhear this and the kings tells him to prove the boast. Macha heavily pregnant is forced to race the king’s horses, her pleas of mercy, asking to wait until her children are born, go unheard. Being no ordinary woman she wins the race, but falls down upon the finish line and gives birth to twins, before passing back into the Otherworlds. With her final breath she cursed the men of Ulster to feel the pangs of a woman in child birth in the hour of their greatest need, a curse that plays out in other myths concerning Ulster. Both the story and Lughnasadh make me think about sacrifice, about what we must or are willing to let go of to become whole or to achieve our dreams. The harvest is a sort of sacrifice. The plant’s life is ended to create food for us. A necessary ending to fuel other life. Similarly Macha reminds us that sometimes sacrifices must be made. We must go through trials by fire in life to accomplish our goals, to learn and grow. where myth, truth, and mystery become one. Sit comfortably. Take three deep breathes and relax. Think about what you must sacrifice to achieve your goals and dreams. Ask Macha to help you release all that hinders your path and to help you accomplish your goals. If you have any spellwork planned do so now. Depart in peace beloved Macha! y me senti en armonía. do you know where i could find the staute in the pic? Stephanie Woodfield has been a practicing Pagan for the past twenty years. A devotional polytheist, ritualist, teacher and Priestess of the Morrigan, she is one of the founding members of Morrigu’s Daughter and The Morrigan’s Call Retreat. She is the author of Celtic Lore and Spellcraft of the Dark Goddess: Invoking the Morrigan and other titles. In her spare time she enjoys creating art out of skulls and other dead things. 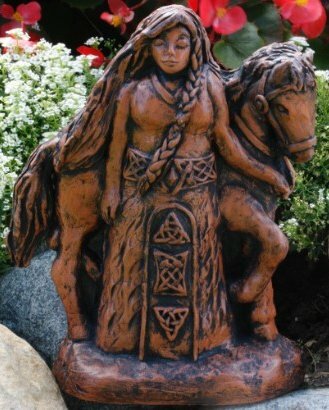 She is called to helping others forge meaningful experiences with the Morrigan, as well as the Gods and land of Ireland.